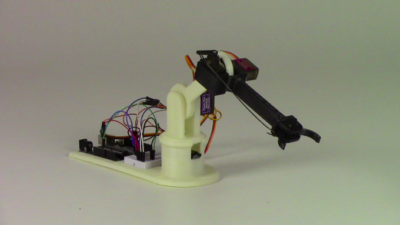 Boise, ID – Slant Robotics has launched a Kickstarter campaign for a 3D printed robot arm, LittleArm. LittleArm is low cost kit for teaching engineering and robotics to students in STEM courses. Bentz eventually showed his creation to colleagues and friends in the area. Many asked him to make them one. But when several STEM teachers expressed interest in the arm for their classrooms Bentz decided to turn the kit into a product, at Slant Robotics. Thanks to rapid prototyping techniques the LittleArm was ready for production within just a few weeks. It utilizes high strength metal-geared microservos, and is controlled with a standard Arduino Uno allowing it be programmed using graphical software such as Blockly. When connected to a computer, Slant has created a simple graphical app which allows the arm to be trained to execute a set of motions. 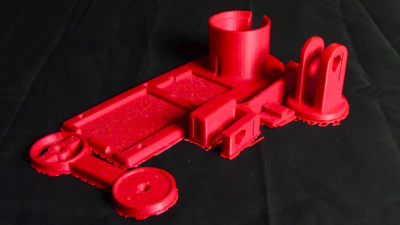 The entire project is open-source, allowing anyone to download the 3D designs and software and build their own LittleArm. At the time of this release, the LittleArm Kickstarter campaign has passed the halfway point, after being live for just 2 days. Over the next few months the team at Slant Robotics will be developing software and producing teaching materials so that students and teachers can easily use the LittleArm when it arrives. Slant Robotics is a startup located in Boise, ID. Its mission to to develop consumer robots for the home, school and business. The LittleArm is the fourth product that Slant has released. Dieser Eintrag wurde veröffentlicht in Crowdfunding, Development, English, General und verschlagwortet mit Kickstarter, LittleArm, Open Source, SlantRobotics von Sebastian Trella. Permanenter Link zum Eintrag.